Yummy Ducksssss - I love you! You can either have it prepared "Kon low" (Dry Noodles with Duck Soup on the Side) or "Chuu Sui" (Noodles Served In The Duck Soup)... I like both but chose to have it "Kon low" that day.... and MMMMMM, it was good. 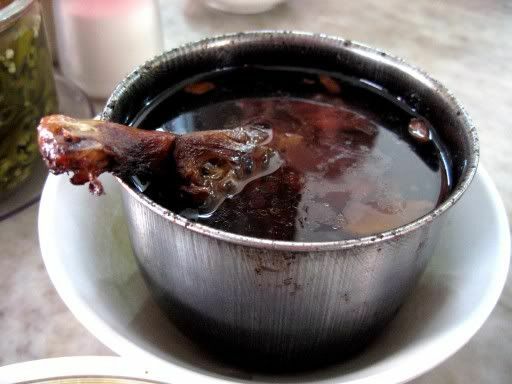 The Duck Soup, cooked with various Chinese herbs, is aromatic and bursting with yummy ducky flavour... You can also tell that it had been lovingly slow cooked as the meat was tender, falling right off the bone. The Wantan Noodles and The "Woo Kok"
The Wantan Noodles were pretty good - P liked that the noodles tasted fresh and springy, but lamented that the Wantans here nothing to shout about. 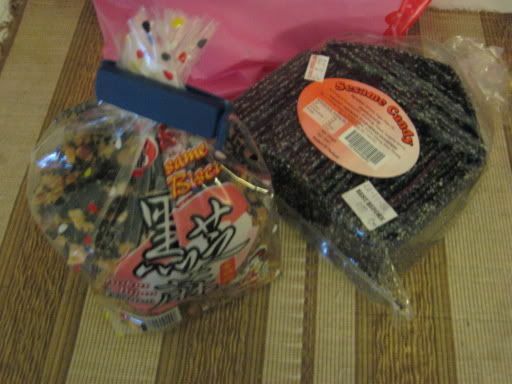 The "Woo Kok" was also ok - worth a try but for about RM1 per piece, it did not rock my world. They have everything from crispy and savoury "Khaii Chai Peng" (Chicken Biscuits) to sweet and sticky "Phong Phieah" (erm, literal translation: Fragrant Biscuits?). If you get confused on what to buy, just ask the ladies at the payment counter - they're usually quite helpful. According to the "See Thouw Phorr" (Boss Lady), this is a 20 hour restaurant - open from about 5.30am till 1.30am (WOAH!). 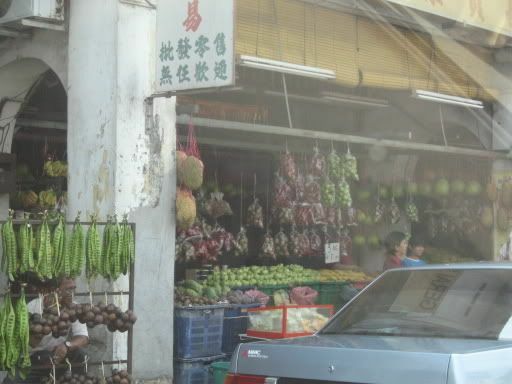 I have always found that the Jambu (both the Batu and Air) sold here is very nice, and do not miss out on buying as much as reasonably sane when I am in the area. Anyway, this brings me to the end of Part 1 of The Happy Wanderer. 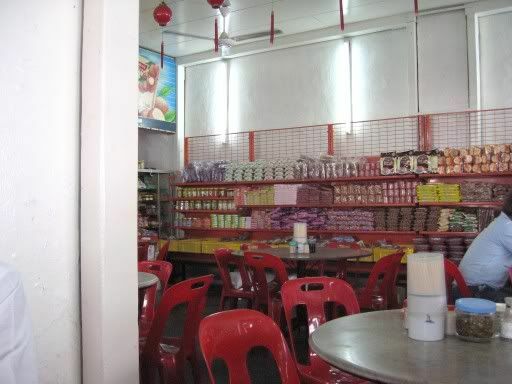 That day, we figured that since we were at Bidor, why not go to Ipoh for Noodles as well? I dunno what came over us that day. Almost forgot - here are some directions to Pun Chun: It's very simple, just follow the North-South highway and turn out at the Bidor toll exit. 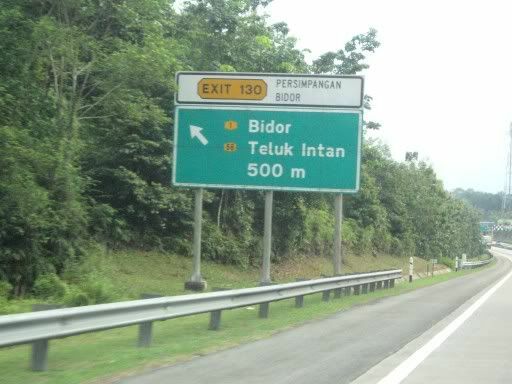 After the Bidor toll, drive straight till you reach a T-junction. There, turn right towards Bidor town. Then, keep driving straight (just a short way down) till you reach a traffic light with a KFC in a building on the left. 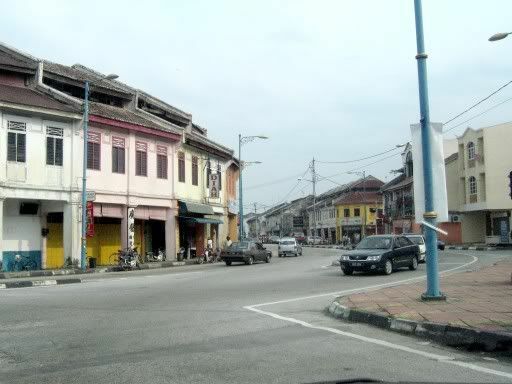 You will now see shophouses on both sides of the road. Pun Chun will be somewhere in the middle of the second row of shops on your right. Don't worry anyway. You shouldn't get lost - Bidor town really isn't that big. He even updates his blog daily!!! eat any place they want. Liszt, Bach in a Minuet. ARGHHHHHHHHHHH!!! PUN CHUN'S NGAP BEI MIN!!!!!!!!!!!!!!! I MISS THEM SOOOOOOOOOOOOOOOOOOOOOOOOOOOOOOOOOOOOOOOOOOOOOO MUCH! I never miss this wonderful aphrodisiac soup when I head towards Pangkor ! Gotta be strong to climnb all those steep gradients u know. R u covering Kampar too ? 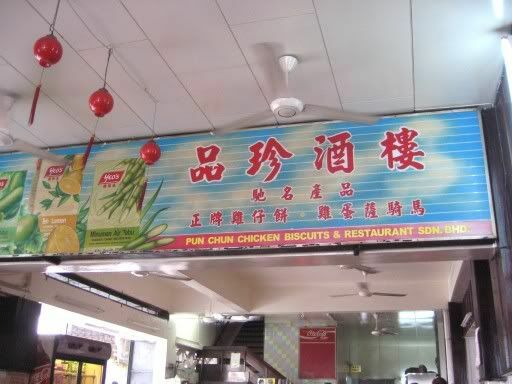 been to this place many years ago... think i was still a kid back then but i don't remember i had duck mee but a wantan mee and yes, i remember that mom bought lotsa guava back too! The biscuits at the shop next door were much better. 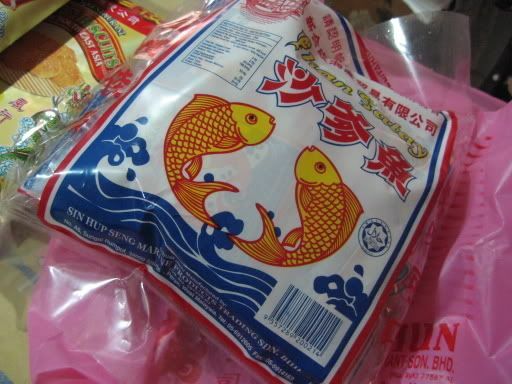 Regretted buying only one packet of heong peng from there... Should have bought by the bucket-load! 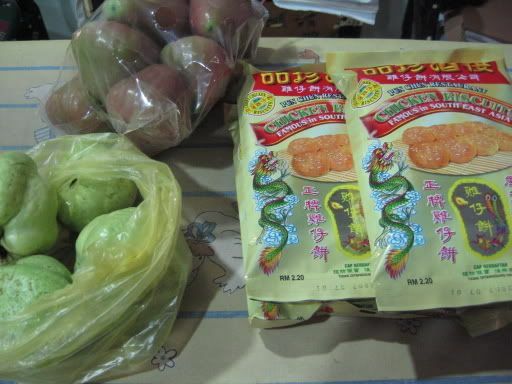 Yeah, the noodle seems a bit similar but prepared in the Wantan Mee style. 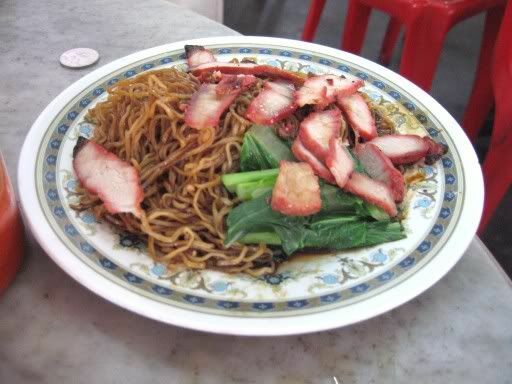 Mmmm,... Kolo Mee - miss it so much! Well, all the more reason to take a drive there and eat it then! 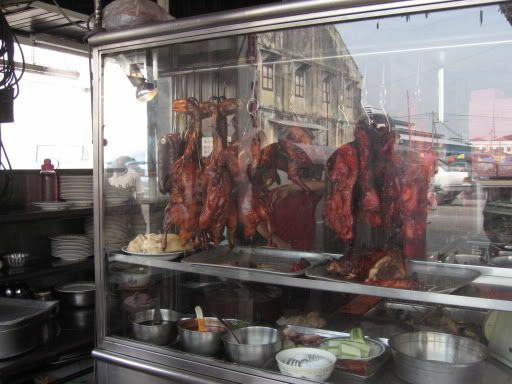 Wow - (business) trip to Penang and then a stop in Bidor to eat? The duck noodle soup is an aphrodisiac?? Wow. Is it better than tiger thingy, I wonder? Anyway, no - sorry not covering Kampar... only Ipoh. Fooyorr... how long ago was this? Go there and try the duck noodles lah. It's worth a try if you're passing by/ in the area. Oh ok.. will check it out the next time time I'm in that area..
j, definitely long long ago... oh by da way, how long does it take to reach there coming from kl? 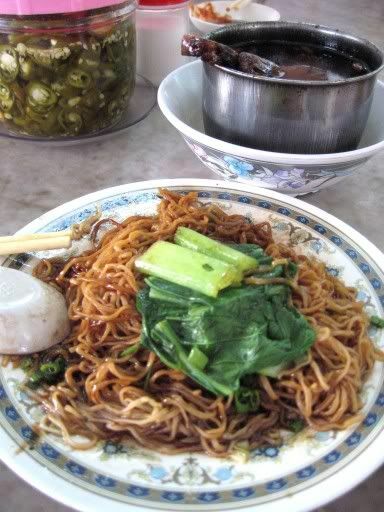 Yeah - 3 cheers for Perak and its Ipoh Sah Horr Fun & Bidor Duck Noodles! I think (if you don't break the speed limit all the way), it should take about 2 hours (and then another 45 minutes more Northwards, you can reach Ipoh). Are you going to go there for a makan visit soon? 2 hours...not too far away wey... hmm... i wanna go!!!.. but not too sure when ekekekeke..
pun chun staff are rude & impatient, only the uncle selling wu kok is nice. Not that I'm saying it's acceptable, but unfortunately that's how service generally is in Malaysian eateries, especially popular ones!